UPDATE all Entrants #GGR2018 Jean Luc and Mark Slats decision time,,,!, what will it be??? 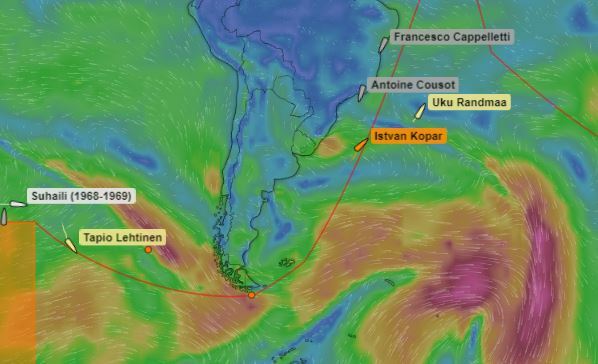 Tapio Lehtinen Sailing is enjoying his sail south, deeper into the Southern Ocean toward Cape Horn but GGR have now alerted him to make east immediately as another storm is approaching from the SW in a few days and it may pass under him if he stays above 50 south Latitude. he is making 3.7kts and is 1500 miles still to run to the Cape Horn. His Auto Tuning unit for the HF SSB Radio is currently not working which means no radio traffic for now and he is trying to fix it so he can get weather reports that will be very important in the future. 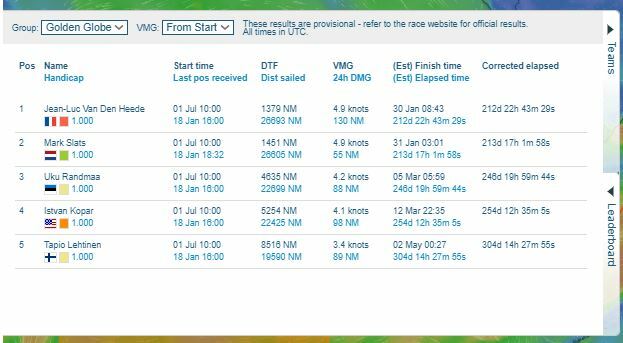 Uku Randmaa Golden Globe Race 2018 is really struggling and very frustrated with the light headwinds and lack of progress over the past week that has seen ISTVAN catch up so much. He is working hard to grab every opportunity to sail north and wishes he was back in the southern ocean maybe where at least the wind was consistent! He wants to get home to see family but also because he has only just enough food to get to the finish line in late February! so his race is very real. Mark Slats is facing a real challenge now and there is no easy answer. 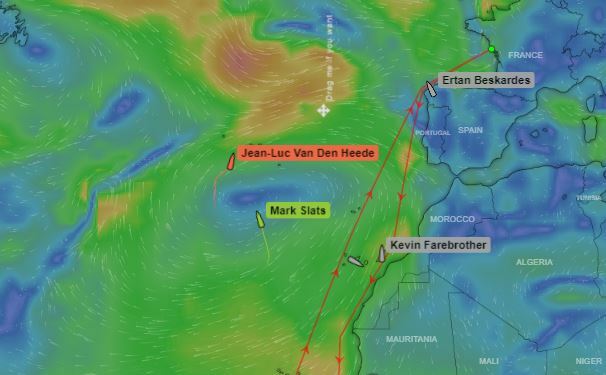 whatever he does now will not give any advantage in the short term he had held his course high sailing to windward for days rather than take the western route around the Azores HIGH , maybe with the intention to go to the east. But the center is now blocking his way. He must decide now! Today! Is it WEST or EAST? If he does nothing he may be stuck in a no wind zone for a few days which is not good so expect to see a move today. Light head winds to the east is shortest track. Go west for faster sailing and it is a longer track?? He cannot talk to anyone about weather but he can listen in to the same weather forecast twice a day that JL VDH receives. One decision at a time and one step toward the finish but which is the right decision? I have no idea? Jean Luc Van Den Heede is benefiting from a clear game plan. He is where he always wanted to be riding the top of the Azores high. He has done this route many times before and now he has a few days of good fast sailing toward the finish. But will it last?. If he goes too far East probably not? as in two days things become light and variable which will require some delicate decisions on where next. But if he turns North tomorrow and goes through the Azores fast enough, a huge ladder to the North then NE may open for nearly a week of favorable winds and he could simply FLY AWAY from Mark slats? Will he take that?? Will the weather forecast be correct? Who knows but the game continues!!! If he gets that right and the ladder falls before MARK SLATS gets to it, JL VDH could create a sizable lead just one week from the finish. It may all hang on the next 48 hrs??? but the ETA for who ever is the winner looks like 1st FEB with a storm on the horizon for that last week? and that could change everything again!